﻿ Anabel Hotel Saint Petersburg. JIMAT di Agoda.com! Ada soalan mengenai Anabel Hotel? Diubahsuai pada tahun , Anabel Hotel memberi jaminan kepada tetamu penginapan yang menyeronokkan di Saint Petersburg sama ada untuk perniagaan atau berseronok. Dari sini, tetamu boleh menikmati akses mudah kepada semua yang bandar meriah ini boleh tawarkan. Dengan tarikan utama di bandar ini seperti Hospital Mariinsky, Panggung Lensovet, Istana Beloselsky-Belozersky berada pada jarak yang dekat, pengunjung hotel pasti akan menyukai lokasinya. Di Anabel Hotel, segala usaha dilakukan untuk membuatkan tetamu berasa selesa. Oleh yang demikian, hotel ini menyediakan perkhidmatan dan kemudahan yang terbaik. Pilihan kemudahan kelas atasan seperti khidmat bilik 24 jam, Wi-Fi percuma semua bilik, meja depan 24 jam, simpanan bagasi, Wi-Fi di tempat awam boleh dinikmati di hotel. Hotel-hotel telah direka demi keselesaan dan memudahkan tetamu. Sebahagian bilik menyediakan selipar, televisyen skrin rata, internet wayarles, internet wayarles (percuma), bilik larangan merokok. Di samping itu, pihak hotel menawarkan aktiviti rekreasi untuk memastikan anda mempunyai perkara untuk dilakukan sepanjang penginapan anda. Nikmati perkhidmatan yang sukar ditandingi dan lokasi benar-benar berprestij di Anabel Hotel. In an internal courtyard (advertisement sign on the main street) in an old building (lift available) of the Nevsky Prospect some 200 meters from the metro station. Room not very big (superior) but extremely clean (personally I don’t like the moquette not even at home). Safe, mini-fridge, air conditioning (despite the fact we didn’t use it) available. Bathroom with shower, small but very clean too. Wi-Fi available in every room. Good choice for the breakfast (English and Continental). Umbrella available in case of rain. Only receptionists speak English, not the rest of the personnel. Anyway everybody is extremely polite and helpful. Good position to have a stroll on the most popular avenue of the city. Lot of restaurants and shops. good location and staff. value for money. The hotel is located along Nevsky Prospekt, but within a courtyard. Just follow the signs, you will reach it. It seems to be located above a night-club area of some sort, because in the middle of the night you can here lots of people talking in the courtyard below, and some music (not that loud). The rooms are clean and quite spacious, and the breakfast is simple but run by a friendly babushka, which makes it feel very homely. Hotel staff are accommodating, giving me a late check-out at the last minute, although I had to shift rooms in the morning. However, they accidentally gave another hotel guest a key card coded for the same room I was extending my stay in, and pointed them to my room, which kind of gave myself and the lady a shock when the door opened! Could've been potentially more embarrassing, though it was a bit hilarious. Quiet, Easy to find and go to Main Tour points, Delious breakfast. Very good. I and my wife were not satisfied one thing that the hotel did not change the towels for three nights. A prison-like security arrangement for a hotel: you need to clear security screening first before entering the premise, then you need to gain access through a solid metal door before reaching you room, another electronic card clearance to open your room door. The room is very crammed with little leg room to move around; the toilet is extremely crammed, hardly any space to move whilst washing your face in the basin; you cannot open your legs more once seated on the toilet seat. 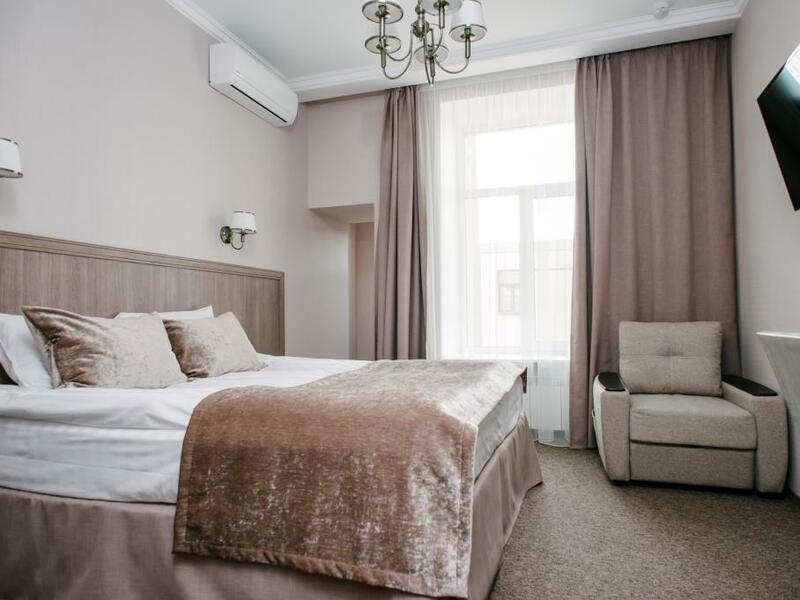 'The hotel is set back from the main road of Nevsky prospekt so although it was close to the metro and many monuments, shops, restaurants etc it was quiet even during the "white nights" when we stayed in late June. Staff were very helpful and room was lovely with small but good bathroom. Breakfast served in a small room with eggs,sausages, toast, jam and good coffee and tea. Would stay there again. Quiet courtyard off busy tourist road close walking distance to main attractions. A good selection of close by restaurants. Close to main station and subway. Simple yet comfortable. If you are passing though with the main emphasis on sight seeing this is a cosy little hotel to pop back to in the evening for regs up for the next day. clean, centrally located, good breakfast. It's only about ten mintues walk from the main railway station (for the train from Moscow), so don't be conned into a ridiculously expensive 'taxi' if you can carry your luggage. When trying to find it you need to look out for the sign on the main road, as it is down an ally and in a building behind the shops and restaurants on the main road. Staff at the hotel were especially helpful (and let me use the computer behind reception, as I didn't have one with me) and also were very friendly (and spoke excellent English). They also arranged a proper taxi for me to get to the station for Talinn when I left. Breakfast was good, but it was nice to be able to get coffee from the machine at any time. Comfortable; clean; convenient; helpful reception The only negative is that the room I was in this time needed some tweaking as there was no bedside table and I couldn't use the mini-fridge as that side of the wardrobe opened onto a small table. The room was big enough to move things around to be better configurated. Stayed one night in March. The hotel is centrally located just off Nevsky Prospect and easy to find. Staff were friendly and helpful and wifi worked fine. The breakfast was fine in the morning. Unfortunately the room was a little small however for a night or two it is fine. Room is quite small but staff are warm and friendly. Overall, quite ok.
As this was a lower cost hotel compared to other hotels in central Saint Petersburg, the room was adequate for the price. Small clean bedroom. Clean modern bathroom. Only a few choices for breakfast but enough to fill our stomachs for a day of sightseeing. Hotel is off a courtyard off the main road so no traffic noise. A few minutes walk to metro. About 15 minutes walk to Hermitage and other major attractions. Many restaurants within a few minutes walk. All staff very friendly with reasonable English speaking skills and very helpful. Very satisfied with our stay. Location. Easy to train station. Helpful staff. Good location. Easy to train station. Helpful staff. Can hear whatever is happening in lobby, but staff monitors that. Good breakfast. On main street. 20-30 minute walk to Hermitage/River. Anabel is located at the city centre, nice breakfast, clean room, nice staff. The staff were very helpful. Room was very clean. Just off the main Nevsky Prospect, through an arch, so able to walk to restaurants, Hermitage etc.